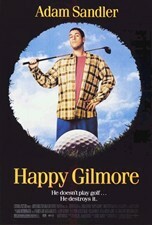 When short-fused would-be hockey player Happy (Adam Sandler) discovers his slap shot skills translate to 400-yards golf shots, he sets out to save his grandmother's house from foreclosure by joining the PGA tour. Along the way, Sandler is tutored by one-handed ex-pro Carl Weathers, angers rival duffer Christopher McDonald, falls for publicist Julie Bowen, and has a memorable on-the-links brawl with Bob Barker (playing himself). 92 min. Standard; Soundtracks: English Dolby Digital 5.1, DTS 5.1, French Dolby Digital stereo, Spanish Dolby Digital stereo; Subtitles: English (SDH), French, Spanish; deleted scenes; outtakes.